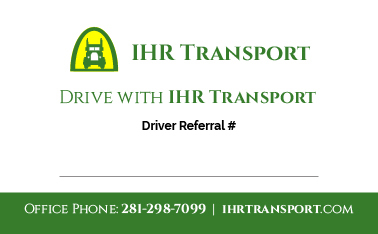 Driver Application – Ironhorse Resources, Inc.
DO YOU HAVE A DRIVER REFERRAL CARD LIKE THIS ONE? Get started by typing their name or referral number below. If you don't have a referral name or number, skip to "name". o	Excessive speeding, involving any single offense for any speed of 10 miles per hour or more above the posted speed limit. o	Reckless driving, as defined by state or local law or regulation, including but not limited to the offense of driving a motor vehicle in willful or wanton disregard for the safety of persons or property.